Hello again and welcome to Day Three of MFT’s April Release Countdown! 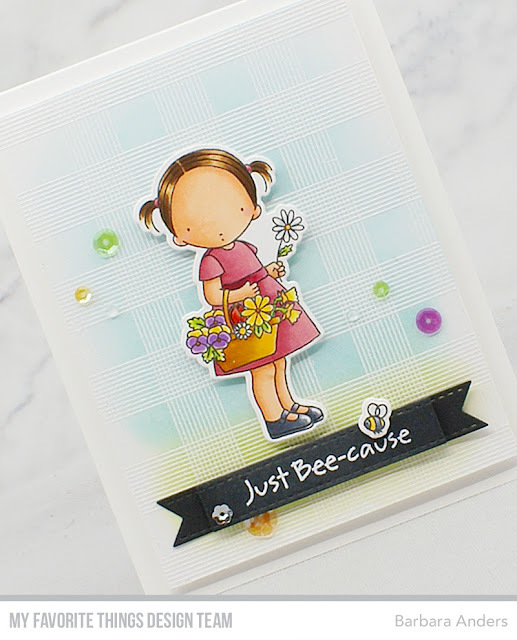 Today we’re previewing PI Bundles of Love Stamp Set, PI Bundles of Love Die-namics, All Lined Up Background, Gifty Greetings Die-namics (Previous Free with $60), and Paper Bag Treat Box Die-namics. Remember that Release is on April 9th at 10am and be sure to stop by the MFT Blog today for all the details. I am loving All Lined Up Background—I think it adds just the little bit of detail and attention that sometimes is all you need. So, I heat embossed it on some Strathmore Bristol Smooth paper and then sponged Berrylicious and Sour Apple dye inks, which brought it out just perfectly—and popped that up on a Sweet Tooth card stock base with foam tape. Then I stamped the PI image with Extreme Black hybrid ink on No Line Coloring card stock, cut it out with the coordinating Die-namics, colored it with Copic markers, and adhered it to the card front, also on foam tape. The sentiment was heat embossed on Black Licorice card stock cut with Essential Fishtail Sentiment Strips, popped it up on foam tape, and finished off with a few sequins. Thanks so much for stopping by today! I’ll be back tomorrow with Day Two of MFT’s April Release Countdown so I hope to see you! What a sweet card. Love how you used the new background stamp with ink blending. This is such a cute card. I especially love how you did the background. It adds just the right touch. So pretty - I love the background and how you colored her dress and flowers. Bundles of Love is the cutest but I'm really digging the All Line Up background. Love the idea to heat emboss and then apply color! This little girl is just adorable. I love what you did with the background rather than leaving it just one color, thanks for the tips! I'm in love with her. Your coloring is unbelievable!